In its landmark 1973 abortion cases, the U.S. Supreme Court recognized a constitutional right to abortion, but held that states could prohibit abortion after fetal viability—the point at which a fetus can sustain life outside the womb—if their policies met certain requirements. Since then, the Supreme Court has consistently reaffirmed the fundamental right to abortion while also allowing new limits on a woman’s ability to obtain one. The composition of the Court became more conservative after the appointment of Justice Brett Kavanaugh in 2018, and more states are expected to challenge the protections of Roe v. Wade by limiting abortion at earlier stages of pregnancy. The current U.S. Supreme Court standard holds that states may prohibit abortion after fetal viability so long as there are exceptions for the life and health (both physical and mental) of the woman. Under this legal standard, viability—which can range from 24 to 28 weeks after the start of the woman’s last menstrual period (LMP) —must be determined on an individual basis, and determinations of both fetal viability and the woman’s health are at the discretion of the patient’s physician. In addition, states may not require that additional physicians confirm an attending physician’s judgment that the woman’s life or health is at risk in cases of medical emergency. The Court’s requirements place decisions regarding the timing and circumstances of an abortion in the hands of the patient and, after viability, her doctor. Most states restrict abortion at a specific point during pregnancy, which normally lasts 40 weeks LMP. In recent years, however, some state policymakers have attempted to provoke a Supreme Court challenge by banning abortion before viability. 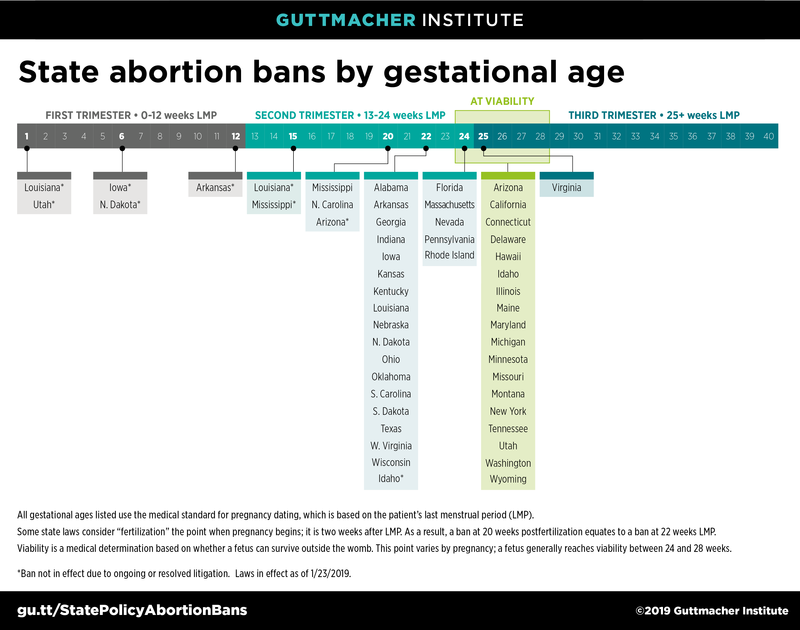 Federal and state courts have consistently blocked enforcement of laws that ban abortion before 13 weeks LMP, but more than a third of states have successfully implemented what are termed “20-week abortion bans.” These bans are based on the unfounded assertion that a fetus can feel pain at 20 weeks postfertilization (an estimated date of conception), equivalent to 22 weeks LMP. Other states have enacted laws that prohibit or severely limit abortion in the second or third trimester (starting at 13 weeks and 25 weeks of pregnancy, respectively). When challenged, courts have struck down laws with a blanket ban on abortion at a specific week or trimester, as well as those with extremely narrow health exceptions. However, not all of these restrictions have been challenged in court. As a result, some states still have statutes on the books that do not meet the Court’s requirements. For example, Michigan permits a postviability abortion only if the woman’s life is endangered, a clear violation of the health exception required under Roe. Some states also continue to maintain and enact new laws requiring involvement of a second physician to certify or attend the abortion under particular circumstances. The overall result is a patchwork of state limitations on abortion throughout pregnancy that leaves many women unable to receive the care they need. Last menstrual period (LMP): The beginning of pregnancy calculated from the start of the most recent menstrual period. An average pregnancy lasts approximately 40 weeks from this point. Postfertilization: The beginning of pregnancy calculated from the date of conception; 20 weeks postfertilization is equivalent to 22 weeks LMP. Postimplantation: The beginning of pregnancy calculated from the date of embryo implantation; 24 weeks postimplantation is equivalent to 27 weeks LMP. General health: Defined by an individual doctor and includes the patient’s mental and emotional health. Physical health: Applies only to the physical function of the patient’s body and may even be restricted to major bodily functions. Viability: The point at which a fetus can sustain survival outside the womb. Determined based on the fetus’s developmental progress and may vary by pregnancy. A fetus generally reaches viability between 24 and 28 weeks LMP. 9 states (including one with two different bans) have attempted to ban abortion before viability but have been stopped by court order. Several of these states still have bans in effect at a later point in pregnancy. 2 states attempted to ban abortion throughout pregnancy. 3 states attempted to ban abortion at 6 weeks LMP, based on the presence of a fetal heartbeat. 1 state attempted to ban abortion at 12 weeks LMP. 2 states attempted to ban abortion at 15 weeks LMP. 1 state attempted to ban abortion at 20 weeks LMP (18 weeks postfertilization in state law). 1 state attempted to ban abortion at 22 weeks LMP (20 weeks postfertilization in state law). 43 states prohibit some abortions after a certain point in pregnancy. 24 states ban abortion between 13 and 24 weeks LMP. 2 states ban abortion at 20 weeks LMP (18 weeks postfertilization in state law). 17 states ban abortion at 22 weeks LMP (20 weeks postfertilization in state law) on the unscientific grounds that a fetus can feel pain at that point. 5 states ban abortion at 24 weeks LMP. 18 states impose a ban at viability. ▼ Permanently enjoined by court order; law not in effect. s Temporarily enjoined by court order; law not in effect. * Based on the assertion that a fetus can feel pain at 18 or 20 weeks postfertilization. † State requires a second physician to attend an abortion that takes place after the state’s gestational age limit. Five states—Alabama, Arizona, Arkansas, Louisiana and Oklahoma—have this requirement only for an abortion after viability. Minnesota requires the presence of a second physician at or after 20 weeks LMP. ‡ State requires a second physician to approve an abortion if it will take place after the state’s gestational age limit. Alabama, Idaho and Kansas require approval only for an abortion after viability. β State law defines pregnancy from the date of embryo implantation. Long-standing interpretation of the law allows provision of abortion up to 27 weeks LMP.